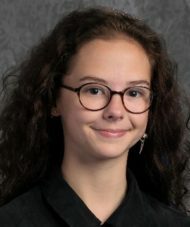 Gracie Edith King, 16, of Lititz, beloved daughter of Amy and Topher King, died Sunday December 2, 2018 in Lancaster General Hospital with her family by her side. A former resident of Robesonia, she attended Conrad Weiser West Elementary School. After her move to Lititz, Gracie attended Linden Hall and Warwick Middle and High School. Since 2007, Gracie attended Camp Conrad Weiser and often said her time on South Mountain changed her life year after year. Keep the Fires Burning. As a junior at Warwick High School, Gracie was Woodwind Captain for Warwick Marching Band, a Key Soloist for Warwick Jazz and Marching Band, and a member of the Orchestra and Concert Band. A member of National Art Honor Society, Gracie was a skilled artist and painter. She was also involved in the Gay-Straight Alliance and Mini Thon. Music was Gracie’s life and she had an incredible talent for it. Gracie would play and compose music on the piano, saxophone, ukulele, and guitar. Gracie enjoyed playing D&D with her friends and making puns and hilarious movies with her sister. She will be remembered for her love of music, art, nature, and her desire to always help others. Surviving in addition to her parents: her sister, Livy Bright King, maternal grandparents, Lynne (Ahrens) Sarig and Lynn W. Sarig of Berks County, her paternal grandparents, Anna King of Dublin, Ireland and Norman King, of Cork, Ireland. Also surviving are many loving aunts, uncles, and cousins on both sides of the Atlantic. A Celebration of Life Gathering will be held on Saturday, December 8, 2018 from 6:00-8:00pm at Charles F. Snyder Jr. Funeral Home & Crematory at 3110 Lititz Pike, Lititz, PA. During the gathering, guests will be encouraged to share a special memory of Gracie. Guests should dress casually, and wear their “fandom.’ Prior to the Celebration guests will be received from 1:00-3:00pm and again from 4:00-6:00pm. In lieu of flowers, donations in Gracie’s memory can be sent to The Jason Foundation at http://jasonfoundation.com or The Trevor Project at www.thetrevorproject.org. Dr. Kathy just shared the news with me about Gracie. She was a free spirit and will be dearly missed. My sympathy to all of you. I just saw the text of this page, sent to me by Beth a week ago. I will send along a longer letter soon. You have become members of a group no one should ever have to belong to and I know you are aware that I’ve been in this group since Oct 23, 1997, when we lost our son Eric. There is nothing I can say or that anyone can say to lessen the pain of your lives right now and for a long time to come… forever. But I’ll try soon and meanwhile I am always here for you both, always… and I love you both dearly. I’m sorry for your loss doesn’t quite cover it, does it? But it comes from my heart, as it does from the hearts of everyone else here. I’m holding you both closely and loving you, always! My deepest sympathy to you and your family. My son went to elementary school with Gracie at CW West. She was always a sweet child. May her memories you hold so dear remain in your hearts, keep her alive in your hearts and comfort you. Please watch the video by Rascal Flatts titled “Why.” May she rest in peace and know she is no longer in pain. God Bless you. Embracing you all from afar with love and hurt for the loss of your beautiful Gracie. My deepest condolences to you all at this time. I am so sorry for your loss and just want you all to know you are in our thoughts and prayers. Please hug Livy for me. We are here for you. Our family cried when we heard. Love to you. Gracie will never be forgotten. We are so incredibly saddened to hear about the loss of Gracie. We never got the opportunity to know her personally, but to read about who she was, she and Cailin would have gotten along fabulously. Know that our thoughts and prayers are with you during this difficult time. Sending much love Missy, Peter and Cailin. It is impossibly hard to find the right words to express our condolences and sorrow for the loss of your precious daughter. Know that Gracie and all of her family are in our prayers. May the brightness of her smile shine in your hearts forever. Since I can’t make it to the service… I hope that someone will impart my words to those present. Gracie. You always wanted the best for everyone. There was no length that you didn’t go to in order to try to help someone you thought that you could. You gave so much of your happiness that you forgot to keep some of it for yourself. No simple words can describe the happiness, the joy, the fun, the silliness that you brought to other people’s lives. No words can describe the crushing loneliness and the aching sadness that you felt at the end of each day. Jack, you saw this light at all times. When it was brightest, when it was darkest, when it was struggling to stay alight, and… Well…… In times of need and burden, we have to rely on other people to bear us up. It’s not perfect. It doesn’t take away the pain. A lot of times it feels worse. But Gracie would never want anyone to linger in that darkness, as she did. Stop thinking about what could’ve been different, and remember what actually was. The smiles, the happiness, the small memories that make you giggle every time you think of them because it was just that good. Each person has those moments. That was what made Gracie special. Every moment that she spent with someone, she made sure to make that person feel special. You could feel her desire to make someone smile. In the name of that specialness, wipe away those tears, and promise to never forget that smile that she gave you. Gracie will always be a smiling, happy, and sweet grade schooler to me. I remember her fondly. Reading about her teenage self, she sounds like just the kind of person we need in this world. I will wear my fandom on Saturday for her. My thoughts and love are with you all. Our daughter Kieran is a camp friend of Livy and knew Gracie from summers at Conrad Weiser. She and we send our deepest coldolences during your time of loss. May Gracie’s beautiful memory live on in everyone she touched. Peace and love to you all. Gracie was my bunk mate at camp and close friend. she opened my eyes and taught me to see the world in a different way, a more beautiful way. i will never forget when she took me to her special spot at peak and held my hand because i was scared of the bats. she held me tight when i was crying because i missed my parents. i will never forget the giggle fits we had late at night and how she dragged me out of bed in the mornings. i love Gracie with every inch of my being and am devistated to hear of her passing. words can’t even describe how much i will miss her. she was a very special person to me and i am so thankful that i had the privilege to meet her. i’m sending much light and love to her family. I did not know your beloved, Gracie, but her picture speaks volumnes. She was a beautiful young woman. May you find peace and comfort in your memories. Gods Speed Gracie ! To the Kings, and their families- Michele and I send you love, peace and healing as you grieve for such a beautiful soul. Keep those fires burning. May God be with you and your family. My daughter spoke very highly of you Mr. King and if she was anything like you she was a wonderful person. I’m sorry for the passing of this beautiful human. I loved her but not as much as you guys did. She made me smile in GSA and class. I wish I could turn back time but it isnt possible. Thank you for raising such a beautiful daughter, I’m so greateful for the time I had with her. I personally attended Warwick and graduated from there and I never knew Gracie but, I wish that I did. She seems like such a sweet loving and caring little girl and my heart goes out to her. Words fail when the universe does not allow a spirit so free and so joyful to stay among us longer, much longer. All my heart and all my love goes to you right now, Amy and Topher. You created a beautiful, beautiful soul in Gracie. To the King family…everything and anything I could say here would not express the sorrow I have for you in my heart. It brings back every memory of the day we lost my son Brison. Gracie was classmate…which now makes us members of a club no parent should ever have to join. Please know I would do anything in my capacity should you need someone to talk to, lean on…or whatever you may need. My profound sympathy and love to you and your family, Amy. I can only imagine your grief and loss. Prayers to the family and friends and classmates.I don’t know the family. just wanted to say sorry for your loss losing a child is one of the hardest. Try and remember the good times and her smiles. She looks like she was a beautiful girl. God Bless. She is your Angel 👼 now watching over you all! It is hard to know exactly what to say but I miss our lives ones of course but especially my niece who was just here and gone! It leaves a whole and gap within us but really know they are okay wherever they actually are and most likely warmly welcomed and received with lots of love by family and friends gone before her. Keep your mind, body, soul and heart open for all the little messages and instant you may see, hear or feel her with you. She is still with you just on a different plane. So sing, talk, laugh, cry and remember for she’s there. Maybe a sound or smell even a song or show she has sent you. Love and Hugs, believe me crying right now too but she wants to let you know this. I hope this helps a little. Amy, Topher, and Livy, I am so deeply sorry for your loss. Gracie sounds like an amazing person and a beautiful soul. I know there are no words that will offer any comfort, but please know, my heart, thoughts, and prayers are with your family. I didn’t know Gracie, but I’ve lost someone very important to me and the grieving process is long, don’t rush yourself and hold anything in. I’m sorry for your loss and my condolences go to your family and those affected! There are no words, Amy. Hugs for all of you. I just don’t know what to say. Such heartbreak. I am so deeply sorry. Gracie sounded like a beautiful-soul person, just like you, Amy, who touched so many hearts, and was smart, talented, and kind. Sending you and yours so much love. I don’t know your family, but I wanted to let you know, people care and are praying for you. Your daughter was a very beautiful and very talented young woman. I’m so sorry for her passing! Our children are having to experience much different challenges than we, their parents and grandparents. It’s hard to be a kid in these times. I pray for your family’s healing, and for the soul of Gracie. God’s Blessings! My heart breaks for my dear friends Amy and Topher. Livy, I cannot express my sorrow. Amy, my heart breaks for you and your family. Thinking of you all right now. While I never had the chance to meet Gracie, in person, I will always cherish the video of her singing beautifully and playing the uekele for her mom in the car. I didn’t want that ride to ever end. Oh Amy, Topher, Livy. You are all in my hearts every crushing minute. That beautiful girl. Your beautiful family. We love you all so hard and we are all here listening, bearing witness, loving you. Much love to you all at this time. I am grief stricken and so, so sad for your loss. Gracie was a wonderful person and life is so, so unfair. May the fire of your love and your memories burn the hours away until you can be in a thankful place for the blessing of this precious human being in your lives. So very sorry for your loss. My deepest sympathy and prayers to all of you. I am so sorry for your loss. You all have been in my thoughts in prayers all week. Much love being sent your way. Sending as much love as I can. Let it wrap around you during this time. Sending so much love to all of you. So very sorry for your loss, Praying for you all, Jessie & Joe McGee Sr.
Amy and family, so very dhattered for you. Sending all love. She was a real live wire; I so enjoyed watching her do jazz solos w/the band. So very very sad to not be able to see her anymore. She will be missed by so many. We pray that God may give you peace and comfort in this time of tremendous grief!